FRANKFURT (Reuters) - German carmaker Daimler is planning to test self-driving trucks as early as this year, executive board member Wolfgang Bernhard told a German newspaper. "We are positive that we will get approval for tests on German motorways within the next weeks," Frankfurter Allgemeine Sonntagszeitung quoted him as saying. "Then we will start immediately." First tests of semi-autonomous trucks will take place in Daimler's home state Baden-Wuerttemberg while the start of production is 2-3 years away, Bernhard, who is in charge of Daimler's trucks business, told the paper. "We are leaders in this technology and will stand up for ourselves," Bernhard said, acknowledging that Apple, Google and other companies were trying to position themselves in the promising business of autonomous driving. 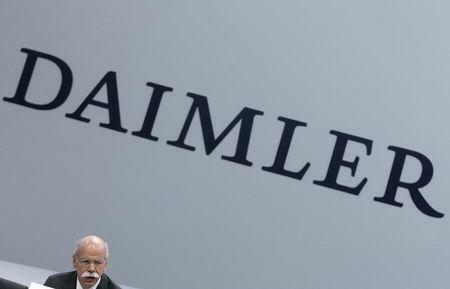 He said that Daimler was unfazed by moves of companies like Apple to poach Daimler employees. "That is a clear sign of recognition if Apple decides that your business - cars - are so important to them that they want to be part of it." Google earlier this month began testing its self-driving cars in Austin, Texas, expanding efforts to gather information on how the prototypes interact with traffic, road conditions and people. Technology groups as well as automotive manufacturers and suppliers have said the technology to build self-driving cars should be ready by 2020.